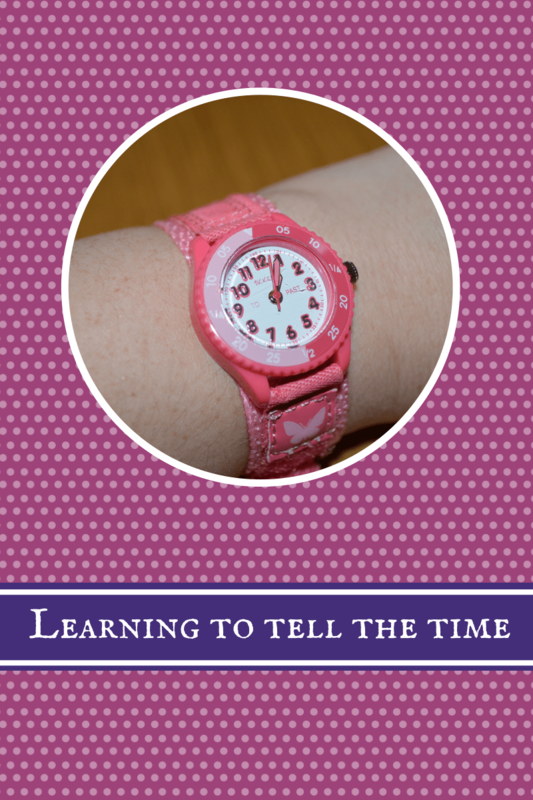 One thing I wanted when I was younger was one of those books that came with a watch, with a red strap and it had the inner circle on the face to help you tell time. I can remember some of my school friends having them and I was always very envious of them. Now that Roo has started to learn how to tell them time I feel it is important that she learns how to tell the time using a clock face rather than just a digital clock (I do not want her to turn into Joey Essex, especially after his I’m a Celebrity confession that he can’t tell the time on an ordinary clock/watch). With her homework arriving asking her to complete the clock faces with the correct time I thought that it would be good to try and encourage her to understand time throughout an average day. So when Peers Hardy kindly offered to send us a couple of watches to review, I knew the ones I wanted to select. 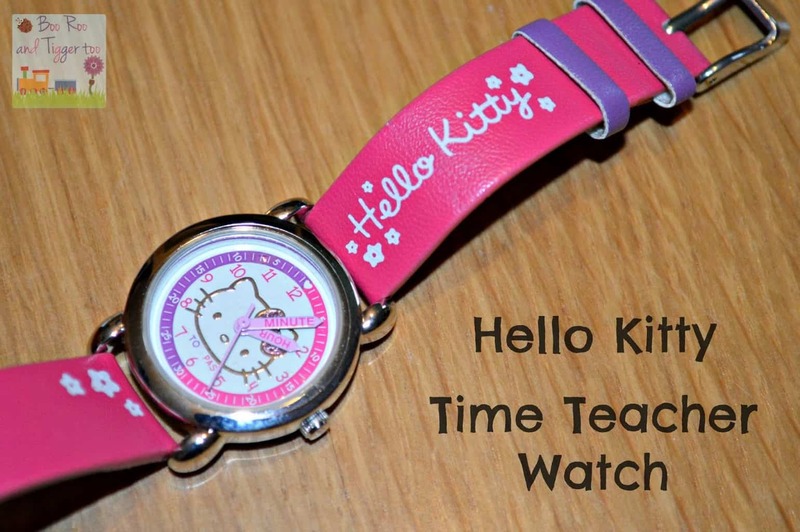 Roo was lucky enough to be sent two time teaching watches, a Tikkers Butterfly Time Teacher watch with Velcro strap and a Hello Kitty Time Teacher Quartz Watch. 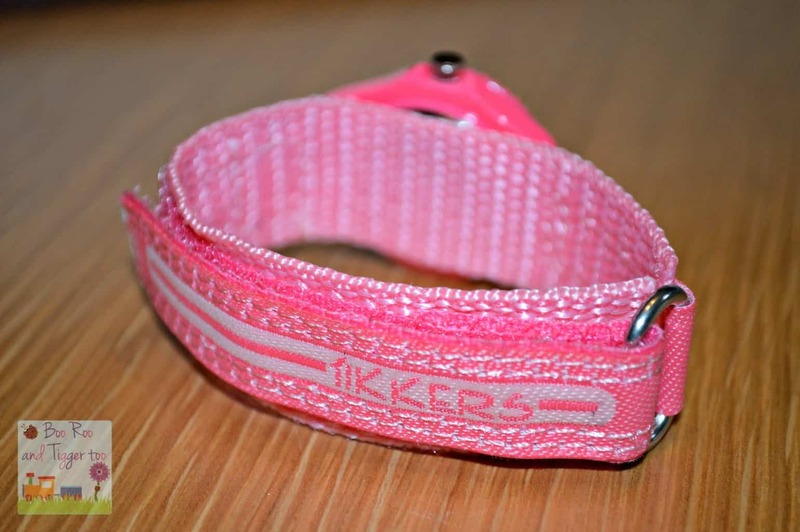 The Tikkers watch with Velcro strap was the watch I was most keen to try Roo on, she has small wrists ans has the same issue as me in that watches and bracelets are generally too big for our wrists so they soon become annoying. The Velcro strap however, enables Roo to adjust the strap to the tightness that is comfortable for her wrist and as the strap double overs on itself to attach it is secure enough for me not to worry that it is going to come off without her noticing. The clock face itself has fairly large numbers making it easy to read and I’m pleased to see that the time teaching numbers were around the outer edge of the watch rather than on the face making it clearer for younger children to see both the numbers, hands and rotating time teaching dial. 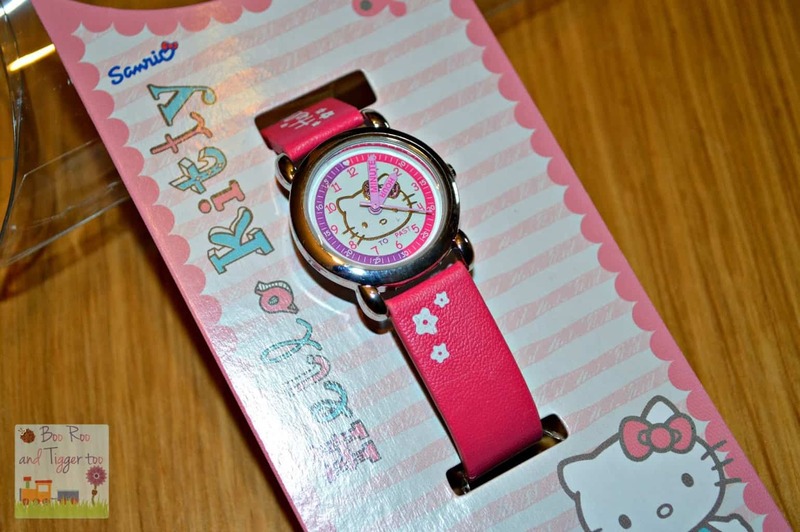 The Hello Kitty time teacher watch I feel is aimed at slightly older children than Roo (age 7). The watch itself has a more grown up feel to it, actually I’d quite happily wear it myself. The hands come with hour and minute written on them to help with any confusion about which hand it which. The minute time teaching aid is around the outside edge of the watch face with the hours underneath, this does make the face feel a little squashed which is why I think it would be better for older children who maybe have the hang of time telling but just need that added reassurance of the minute time guide. 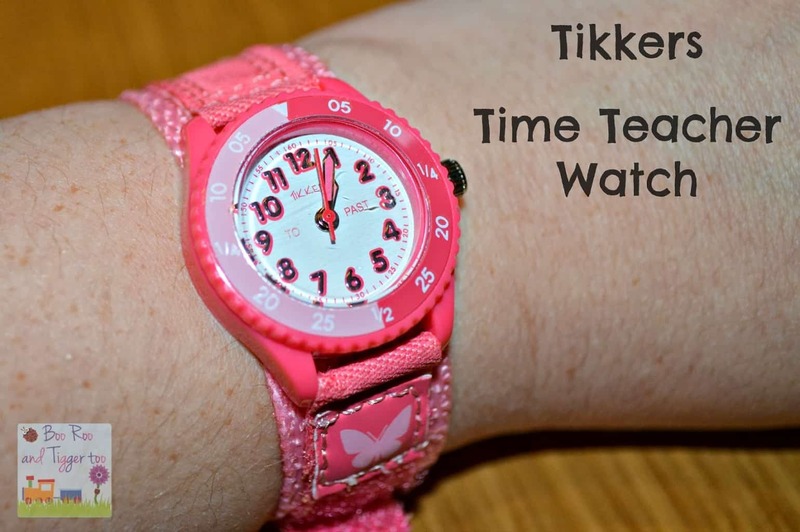 Roo felt so grown up wearing her own watch and found the Tikkers watch easier to take on and off herself. The Hello Kitty was obviously her favourite design as she loves Hello Kitty, however she did struggle a little to make out the minute time guide so opted to wear the Tikkers more often. Her time telling skills have improved, although she does keep asking me if I want to know what time it is! 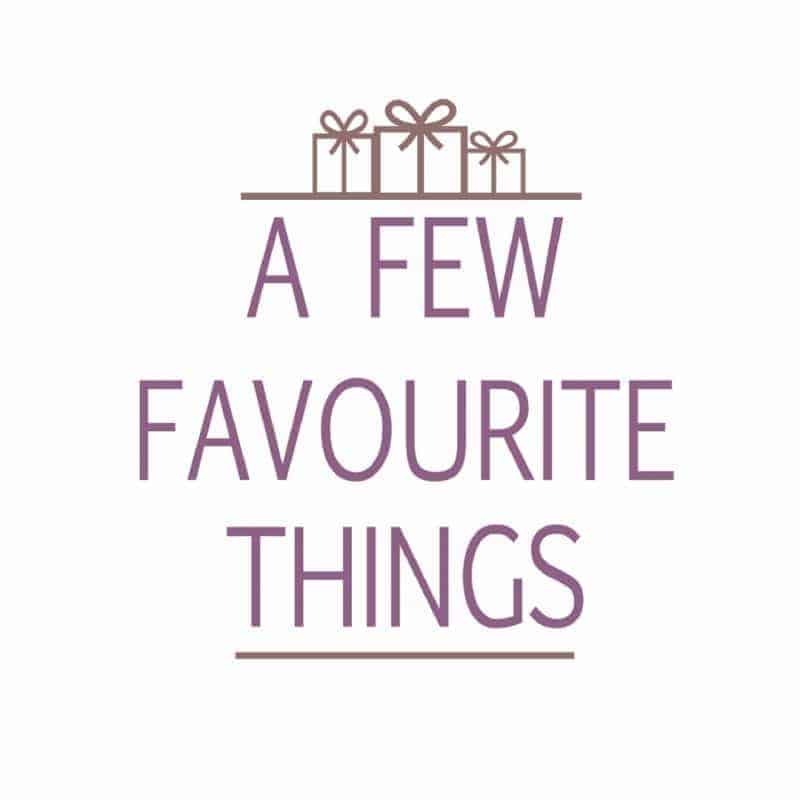 Available from Amazon, John Lewis, Debenhams and all other good watch retailers. Disclosure Policy: We received two Peers Hardy watches FOC for the purpose of review.